These are sick. Love them. I’m a baseball card junkie, so I see this and I start salivating. This is what season tickets should look like. Love it. Padres should do this. Take notes, Garfinkel. Not that I’m particularly proud of this… but even from this small picture, I can tell you, from memory. These are all Topps cards, and left to right the ones I know are… 1954 Ernie Banks, 1982 Jody Davis, 1988 Andre Dawson, dunno, 1961 Ron Santo, 1983 Ryne Sandberg, 1962 Lou Brock, dunno, 1970 Ernie Banks, 1984 Ron Cey. 7 out of 10. I didn’t google to confirm all those… but I’m pretty sure I’m right. Savant-esque. The Cubs aren’t even my team. Ok, fine… I am particularly proud of this. 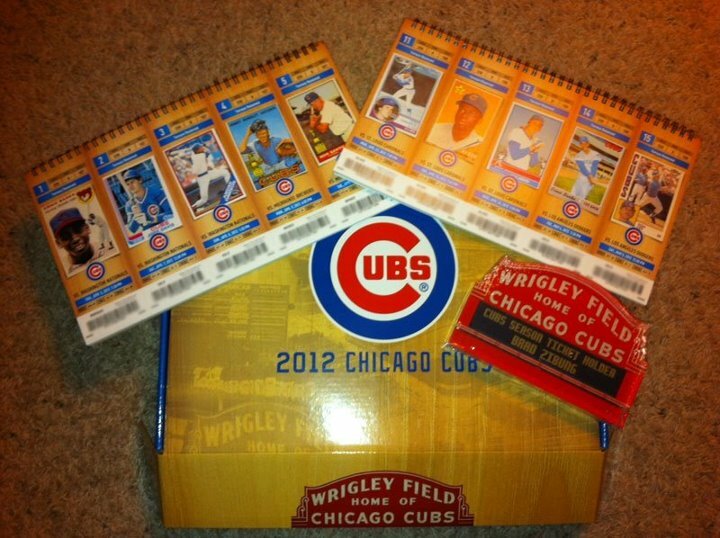 This entry was posted in Baseball, MLB and tagged baseball cards, Cubs, cubs season tickets, topps cards. Bookmark the permalink.